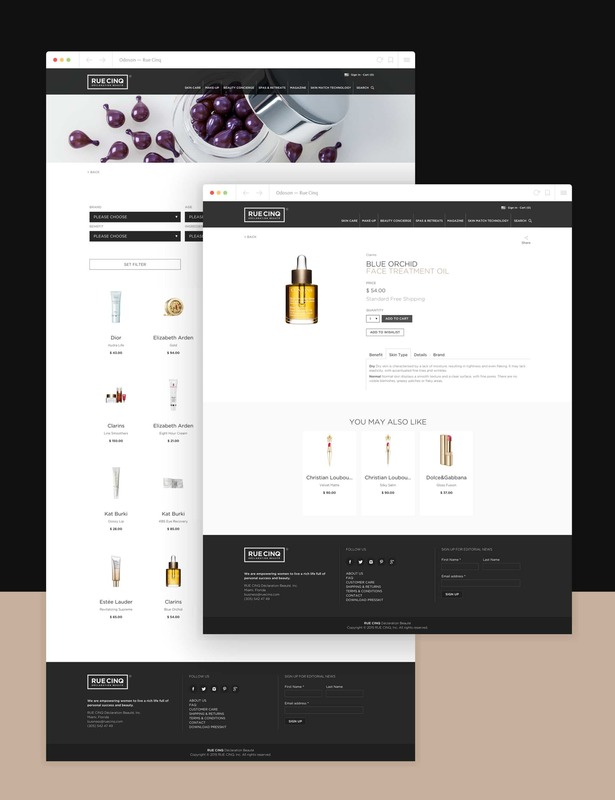 Rue Cinq, a luxury online cosmetic shop, asked Odoson to implement its website, which included a web shop, a beauty concierge, and a digital magazine, from a set of design guidelines. Through their website, Rue Cinq wished to provide cosmetic consultations and empower women to live a rich life full of personal success. Rue Cinq needed a full-fledged web shop, but as they currently have no inventory of their own, the shop needed to pull products Rue Cinq selected and their associated specifications from external sources. The order process on the Rue Cinq website was then also to be fulfilled automatically by these external providers. 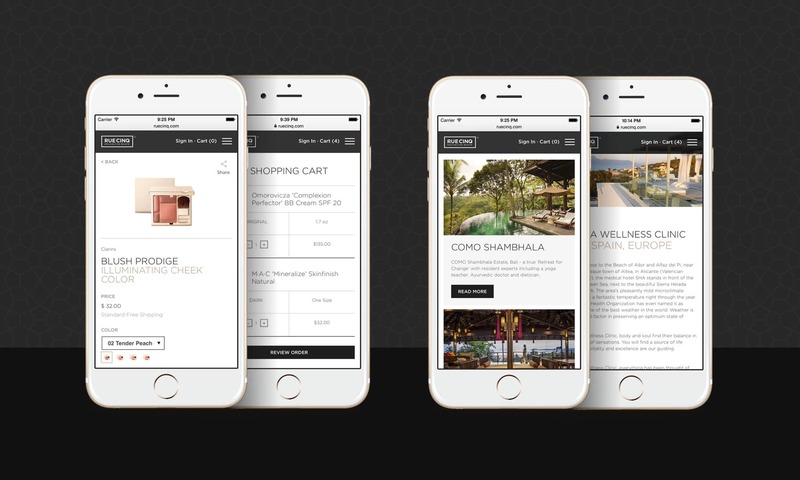 Naturally, the shopping experience also needed to be as pleasant on mobile platforms as on larger screens. We created a unique web shop solution for Rue Cinq that supports the Rue Cinq brand and community. The shop itself, built on WordPress and based on a brief set of supplied design guidelines, offers a smooth curated retail experience and is extended with custom functions for user profiles, wish list management, and each user’s product portfolio of products previously purchased. We also extended the given design guidelines to design responsive versions of each page. 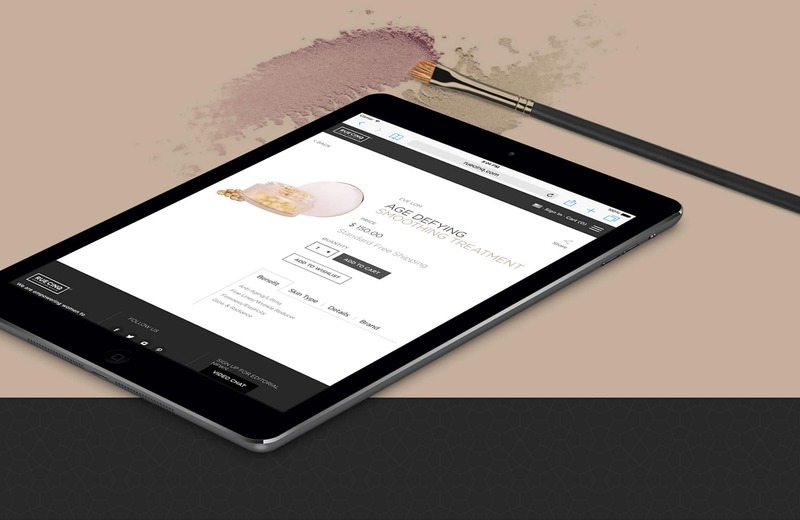 An online magazine and beauty concierge round out the Rue Cinq website and connect shoppers to the Rue Cinq team and their expertise in skin care and make-up. For the Rue Cinq team, the selected shop articles and their components are easily managed. Product information from retailers is loaded through Varinode, a unified multi-retailer checkout API. Using Varinode, customers of Rue Cinq can buy directly from multiple retailers within the Rue Cinq interface, without Rue Cinq carrying any inventory. Orders are then processed in real-time and fulfilled by the originating retailers. Product information is loaded from Varinode and then temporarily saved to a dedicated database, so the page loads quickly. Altogether, the web shop is able to be managed in a “hands-off” fashion, with invoicing and any notifications of exceptions to support handled automatically. This allows the Rue Cinq team more time to focus on supporting women and matching them with the perfect cosmetic products for their skin and lifestyle. The Rue Cinq online shop is mobile-optimized to offer the same great social shopping experience on small screens as on desktops. Swift, finger-friendly navigation and simplified views of content throughout the mobile version of the site mean that women in the Rue Cinq community can find new products or peruse the Rue Cinq magazine strolling around Saint-Gemain-des-Prés in Paris, waiting for a flight to New York, or wherever else their determination take them.